If you know a 10 year old girl, then you’re going to need some ideas on what to buy her. They’re not the easiest to buy for, they’re at that awkward in-between stage of childhood and their teenage years. Our list of gifts for 10 year old girls should make your life a little easier and you’ll get a gift for her we know she’ll love. Every girl likes a piece of jewelry and a 10-year-old is no exception. It’ll make her feel more grown up and will be something for her to keep for years. Choose between gold, silver or rose gold, and this personalized necklace will be her favorite gift this year. If you’re looking for gifts for a 10-year-old girl, they’re more than likely a fan of Shopkins. This season 7 Join the Party pack features 12 new party themed Shopkins, as well as brand new Topkins which can be stacked. There’s also 2 glittery lanterns which they can use to display their favorite characters. Give them the gift of green fingers for their birthday this year. This kit will allow them to grow a real life fairy garden which they can plant and nurture themselves. As well as caring for the plants, they can set up the fairies and woodland creatures in their new garden home. Bring out her artistic side with this Aquabeads Beginner’s Studio. She’ll be able to create wonderful pictures without making too much mess. Simply put the correct colored beads over the template, spray with water, and watch the beads magically stick together, forming a lovely picture. When you’re 10, growing up and being an adult seems like the best thing in the world. Let her believe this is still the case for a little while longer and give her The Game of Life. Whoever has the most money at the end of the game is the winner. Super women + girl power. There’s no better gift for your budding little feminist this year! Start your Oonies collection with this starter pack. It contains enough materials to make 3 Oonies which magically stick together without the need for glue or water. Have hours of fun with your friends and family making and creating games and adventures with your Oonies. Great for encouraging an interest in science, this DIY kit will teach her how to make her own soap while showing her how exciting chemistry can be. There’s also a few easy science experiment ideas she can do, as well as making her own fragrant soaps. Turning 10 is a huge milestone so you’ll want to get her a gift she can keep for years. This personalized jewelry box is perfect; she’ll use it to put all of her sentimental pieces in as she gets older, and she might even use it for her wedding jewelry one day. School can be super dull for a 10-year-old so why not get them interested and engaged at home? This 20-piece science kit has all the bits you’ll need to do some basic science experiments, including chemical reactions. They’ll also learn how to use science tools properly, an invaluable skill for a budding scientist. Gifts for 10-year-old girls aren’t always easy, as it’s hard to know what they’re into one day to the next. You can’t go wrong with this personalized water bottle; drinking enough water in a day is important and she won’t forget to drink with her very own geometric bottle. Fingerlings were the must have gift of Christmas 2017 and it looks like they’re here to stay. Combine this sought-after toy with another big trend, the unicorn, and you have the perfect gift for a 10 year old girl. Gemma the unicorn will respond to motion, touch and make loads of cute noises too. Inside each ball, you’ll find 9 surprises and you won’t know what is coming next – will it be the doll, an outfit or maybe their shoes? Find the ribbon, pull it and wait for the confetti to pop out! LOL Surprise dolls are the most exciting gift since pass the parcel! Set to quickly become her favorite board game to play with the family, Pandemic is a co-operative game in which 2-4 players must play to their character’s strengths to try and cure the four diseases which have broken out all over the world before humans are wiped out. Give your 10 year old somewhere else to do her homework with this personalized lap desk. Choose from 4 colors and add any name and initial. The underneath is a super soft pillow which will be comfortable on her legs, and the top is hard enough to support workbooks or a laptop. The perfect gift for little animal lovers, these animal squishies are small enough to fit inside a pocket or bag, meaning she’ll be able to control her stress and worries quickly. This set contains 16 different animals – she’ll have a hard time choosing her favorite. Adding this rainbow lava lamp to her room will make her take pride in her space; she might even clean it once in a while! The rainbow glitter and lights will create a shimmery swirling glow over her room, making for a calm atmosphere for her to go and relax in. She’ll have hours of fun making claymotion videos using her smartphone with this movie kit. Inside you’ll find clay, interchangeable backdrops and props and a phone stand. Simply choose a stop motion app and away you go! All she needs to add is some imagination. Based on the popular card game, Apples to Apples is a game which will develop their vocabulary and thinking skills all at the same time. As part of the game, they also need to convince “the judge”, so clever use of persuasion is also needed. L.O.L Surprise balls are a gift within a gift. And this Big Surprise ball is bigger than any you’ve seen before. Inside, there are 50 surprises, all of which will go with any other L.O.L Surprise balls they’ve already got. Get this limited edition one before they’re all sold out. Trying to choose gifts for 10 year old girls? This bracelet is perfect for this milestone birthday as it’s something they can keep and remember the day by. 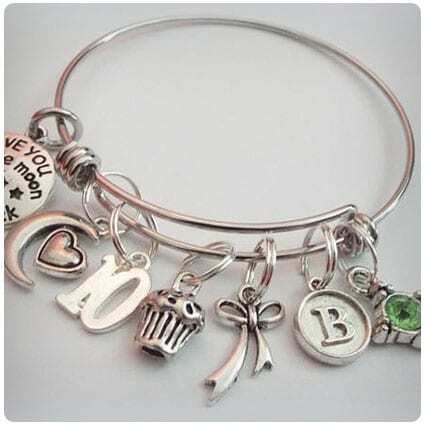 Choose their birthstone and initial to appear on the bracelet to give it even more of a personalized feel. If your 10 year old is interested in fashion, then this Crayola Light Up Tracing Pad is right up their street. It contains 12 tracing sheets, with more available online, as well as blank sheets and pencils. The light box makes for easy tracing, allowing them to come up with their own fashionable outfits. The classic card game Uno has had a bit of a makeover. You can now play this well-known game with the added modern emojis which we’ll all recognize from texting and social media. This is sure to get your almost teenager interested in family game night. Learning is so much more fun when it’s engaging. Buy your daughter this STEM based toy and she won’t even realize it’s educational. Build the challenging towers and get the marble to fall from the start position to the target tower which will help develop their spatial reasoning. Make the sidewalk or backyard more colorful with this sidewalk chalk pack from Crayola. It contains 64 different chalk sticks, including some neon colors and glittery varieties. Easy to clear up with either water or rainfall, you can let your child go crazy, knowing it’ll wash away with ease. Let their artistic minds go wild with this Melissa and Doug drawing pad. They’ll be able to fill the blank pages with all sorts of creative and colorful drawings – whether they choose to use pencils, pens, paint or even chalk, you’ll put their creations on your refrigerator with pride. If your daughter dreams of being a mermaid, make her dreams come true with this mermaid blanket. You can choose between blue or pink and then she can cuddle up under it, dreaming of the waves. Super soft and snuggly, she’ll never want to use her legs again! When you need gifts for 10 year old girls, a JoJo bow is perfect. But with this bow maker kit, she’ll be able to create her own bows in any color and style she likes. She’ll soon be the envy of her friends, with her new stylish bows. We all love to pamper ourselves, and a good bubble bath is a great place to start. Get her this DIY bath bomb kit and she’ll have a lot of fun, creating deliciously smelling bombs to drop into her bath and watch them fizz away. She’ll even learn some basic chemistry while putting them together! Hatchimals are huge and will make a perfect gift for a 10 year old girl. You get 2 in 1 with this egg because inside you’ll find a set of matching twins, but you won’t know what’s inside until you open the egg. The twins share a special bond so you need to keep them close to each other. Encourage her artistic flair with this 50-piece pack of Crayola pencils. They come pre-sharpened so they’re ready to go, straight out of the box. The colors are rich and vibrant, all she’ll need is a coloring book or some plain paper and she’ll be able to create wonderful pictures. Emojis are everywhere and if you don’t know what they are, then you’ve been hiding under a rock for a while! With this jewelry kit, she’ll be able to make 5 colorful bracelets to share with her family and friends, all with emoji themed beads. By using this Melissa and Doug kit, they’ll be able to make 4 beautiful butterfly magnets to stick on the refrigerator or anywhere else magnetic. Inside you’ll find wooden magnets, paints, gems, glitter glue and stickers which will help bring these butterfly magnets to life. This will quickly become her new favorite blanket. With a gorgeous mandala pattern on it and in beautiful blues and purples, it will suit any room theme. She can use it to finish off her bed or to keep her warm when watching a movie. Add her name to give it a finishing personalized touch. Is there anything kids love more than breaking the rules? OK, so they won’t technically be breaking any rules with this color-your-own map pillowcase, but getting to use felt tip pens on a pillowcase? We bet they’ve never been able to do that before. Let her bring new life to her old t-shirts and bedding with this tie dye kit. It contains 18 colors and has enough dye for 36 projects. She’ll love having tie-dye parties with her friends where they can create their own crazy patterns on their old garments. Who said science couldn’t be fun and interesting? From National Geographic, inside this kit you’ll find a variety of different geodes, each one with a hidden crystal treasure. Crack them open to see what’s inside and then learn about how the geodes and crystals are formed. Strategic thinking and cooperation are vital skills needed for this game, and playing it will help develop your 10 year old’s. The aim of this game is to go on a quest in search of 4 sacred treasures from the ruins of a beautiful island. If you don’t want dye damaging your daughter’s hair, why not compromise with some hair chalk instead? Inside this pack, you’ll find 5 colorful hair chalks as well as beads, beading tool and elastic bands. The colors wash out easily with shampoo so you don’t need to worry. This novelty gift will be a great source of amusement with your 10 year old daughter and all her friends. They’ll be able to find out the answers to their burning questions, like whether or not that boy likes her back, or if she’ll get a date to the school dance. 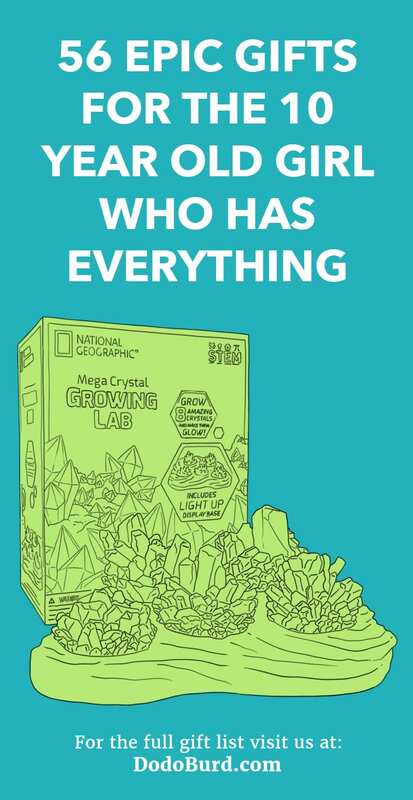 Make science fun for her with this crystal growing kit. She won’t even realize that she’s taking part in a scientific experiment, she’ll just be fascinated with her growing crystals. It even comes with a special display case for her to keep them in once they’re fully grown. Need ideas on gifts for 10 year old girls? That’s the age where they start to take notice of their appearance and want to look their best, and this nail polish maker toy is a great place to start. With added scents, she’ll be able to mix up a colorful combination which won’t only look good, it’ll smell great too! Girls like video games too and with this video game maker, she’ll be able to create her very own game which she can show off to her friends. It’s a great way to get them interested in video game development, which would be a great career choice for her. This water bottle will help her remember to stay hydrated. She’ll be able to put her own unique design onto the bottle, which will make her want to show it off and remember to drink from it. It also has a clip which attaches to backpacks etc. so she’ll never lose it. Friendships are super important to 10 year old girls. Giving her this kit for her birthday will allow her to show her friends how much they really mean to her. She’ll be able to make 22 bracelets, in different colors and styles, so each one will be unique. Perfect for pool parties in the summer, you won’t be able to get her out of the water! This bright pink inflatable flamingo ring inflates to over 4ft wide so you won’t be able to miss her when she’s on the water. She’ll be the envy of all of her friends. She will love using this kit to make an awesome dream catcher for her bedroom. Inside the eco friendly box are all the materials she’ll need to create a gorgeous and unique dream catcher; lace, yarn, ribbon and feathers, and the detailed instructions will make it super easy to make. If your 10 year old is a fan of Shopkins, then they need this Season 8 America Mega Pack. Included in this pack are 8 exclusive characters and their Movie Star Dresser. Shopkins from Asia and America are inside this mega pack so what are you waiting for? Slime is the thing to make among young adults these days. It’s fun to make and play with so let them go wild with this slime factory. All you need to do is add water and you’re away. Why not sprinkle in some glitter to give it a different look and feel? If you need gifts for 10 year old girls, these adorable animal speakers are perfect, as they play music and dance via Bluetooth so there’s no need for loads of wires (but you can add one if you want to take it in the car). Choose from a unicorn, dog, cat or fox and get dancing with them to your favorite tunes. Teach them young with this electrical circuit kit. They’ll be able to learn all about electronics by building working circuits, and as all the pieces snap together, there’s no fuss making them up, just a lot of fun while learning all about electricity. There’s enough pieces included to make more than 100 fun projects. Jenga is such a classic game. Take the wooden blocks and build a tower, and then everyone has to take it in turns to pull out blocks without making the tower topple over. It’s a great family game and your 10 year old will love playing it with you all on game night. Not only will she learn how to craft but she’ll also get 2 adorable unicorns to display. They’ll have wonderful rainbow manes and tails with rainbow hooves and glittery horns. It’s a great gift for anyone who loves unicorns and wants to learn a new skill. Don your trench coat and grab your magnifying glass because it’s time for you to turn detective. See if you can figure out who killed Mr. Boddy in his own home by making your way around the board to find the murderer, the room in which the murder took place, and the weapon they used. Grow 5 crystals at home and then you can display them on the special light stand, turning them into a focal point of the room. Choose between 8 colors, such as red, blue and orange, and then use them as a colorful nightlight you can be proud of. Using music as an escape method is normal among most young adults and teenagers. Let them decorate their headphones and give their pair an artistic flair. They’ll love standing out and not being like their friends, and the best part is that they’ll never lose them. Perfect to go on display in their bedroom, on their desk or in your garden, this Rock Pets turtle can be decorated however your child sees fit. This kit includes 6 weatherproof paints and a brush, so your child can make it super colorful and noticeable. Tie dye looks super cool but what if you don’t want to faff around with the dyes and washing? This DIY tutorial shows you how to make a tie dye pattern on old garments using just Sharpie pens, Q-Tips and rubbing alcohol. So simple but it looks super effective. If you’re fed up with finding jewelry everywhere but don’t want to spend loads on a store-bought holder, why not make one yourself? The instructions on I Spy DIY are so simple, you’ll be able to make a few to keep for yourself or give away as gifts. The pin up look is still really fashionable but learning how to tie a headscarf properly takes time and patience. If you don’t have a lot of either, follow this tutorial and you’ll be able to make a simple alternative using a lightweight scarf and a plain headband. Having loose socks lying around the house can be a pain, especially if you don’t want to just throw them away. Follow this tutorial and you’ll be able to turn your old grey socks into cute Pusheen plushies, which will look super cute dotted around your home. A perfect DIY gift idea, these donut bath bombs look good enough to eat. The steps in this tutorial will show you how to make donut shaped bath bombs, complete with sprinkles. Choose delicious scents and cute colors to make them appealing to anyone you gift them to. What do you buy a young book lover when you don’t know what books they already have? Read our list of 30 noteworthy book themed gifts for ten year old bookworms. From do-it-yourself fleece scarves to design sketchbooks, personalized towels, and fashion bags needing personal touches, gifts for 10 year old girls are unique, creative, and meant to stimulate, inspire, and delight. Not yet an adult, still unspoiled, and sweet, pristine treasures. Here you will find the perfect gifts for 10 year old kids that will last. This collection of cool products all exist to promote healthy lifestyle choices that will stick with children for a lot longer than you could ever imagine. Gifts for 10 year old children can be hard to shop for. There is one thing, however, that all 10 year olds love: gadgets. This collection of science and tech toys, gifts and gadgets is the place to find that perfect present. All kids require some time to put their arts and crafts skills to good use as they create a masterpiece. Use this list of art gifts for 10 year old children to supply them with everything they could ever need. Are there really that many it doesn’t seem like it? I like a lot of these they are so cool! Thank you for the ideas for my X-mas list. I LOVE the slime factory!!!! I am a slime creator. I am in 5th grade. I love making slime for my friends like Millie and Briannah.